Labor chairman Avi Gabbay meets Pope Francis, discusses Middle East and the ways to promote peace. Avi Gabbay, chairman of the Labor party and the Zionist Union, met on Tuesday at the Vatican with Pope Francis, accompanied by journalist Henrique Cymerman. Cymerman, who recently joined the Labor party, is considered a close friend of Pope Francis. The Pope spoke with Gabbay and Cymerman about the situation in the Middle East and the possibilities and ways to promote peace in the region. Gabbay said it was time for courageous leaders who are willing to make decisions to do so, instead of aligning themselves with extremists. 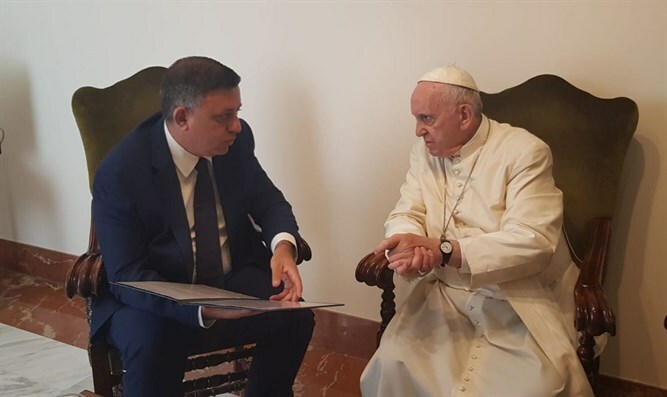 Gabbay told the Pope about the security situation in the Gaza Belt region, and the Pope spoke of a childhood friend who lived in one of the communities in the area. Gabbay also handed to the Pope letters written by the Goldin, Shaul and Mengistu families in which they describe their difficult and painful daily lives, and outline their request to help and advance the struggle for the release of their sons. Avera Mengistu and another Israeli civilian, Hisham al-Sayed, who went missing in Gaza, are believed to be held by Hamas as well. Pope Francis promised Gabbay to help and pass on the letters to senior officials in Vatican City. In addition, the Pope criticized the calls for a boycott of Israel, saying there must be a difference between those who criticize the Jewish people and the State of Israel and legitimate criticism of government policy, including the Israeli government. Criticism of Jews and the State of Israel should be defined as anti-Semitism and be denounced, he said.